digitalsignage.NET allows user to add “Bolt-on” additional features to their Core product account. The flexibility of the Core design gives system administrator’s the power to add the features they required. Report by-User can choose User Audit or Proof of playback. Date and time- By selecting a start date/time and end date/time, the system will provide User activity between these set parameters. 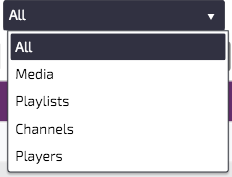 Proof of player reports allow user to provide information based on what media content has played and where it has played. Email reports– Scheduled reports can be emailed to designated recipients.